Long before the days of "Gossip Girl," the preppy look was a go-to for days that yearn for an outfit that melds comfort, polish and lets the inner trend-savvy gal inside shine. With some staple preppy pieces, learn how to seamlessly blend classic Americana with fashion’s au courant faves and achieve a look that represents the epitome of prepster-gone-chic. So it’s not the '50s, and the all-star high school quarterback didn’t drape his jacket around his cheerleader girlfriend’s shoulders on the bleachers. Instead, oodles of modern varsity jackets are on the market, like this Delia’s black and white pick. Pair it with an unexpected floral top, tough leather leggings and suede booties. Voilá. A 21st-century Sandy Olsen à la Grease’s closing carnival scene. 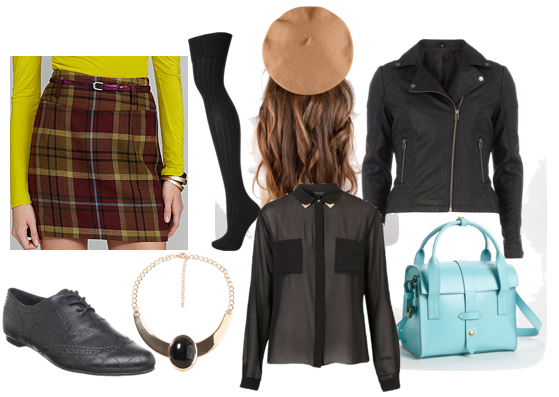 A plaid skirt and knee socks can be executed two ways: ultra chic or ultra kitsch ... the former is preferred. Try a modern, streamlined version like this burgundy, baby blue and mustard skirt from Dillards. Play up the plaid by contrasting with a sheer black button-down, topped with some shiny gold necklaces and a leather (or go faux!) biker jacket. Finish with ribbed knee socks, oxfords and a beret, and it’s time for brunch with Blair Waldorf. Pop quiz: how many crew neck sweaters is too many? The answer: no such thing! For a modern take on a classically preppy sweater/skirt combination, texture is key. A basic sweater (or one with a fun print or pattern) gets amped up by on-trend additions. Opt for a leather skater skirt, which differs from an A-line as it requires significantly more fabric to construct. Then add black opaque tights, a studded belt, oversized clutch, trendy wedge trainers and a trendy top knot. Prepster-chic isn’t an oxymoron per se, but it certainly walks a fine line between cute and cliché. These quick and easy outfit ideas are ideal for trying out the trend while keeping it cool.